There is a beat-to-beat 180 degrees change of axis. This feature differentiates bidirectional VT from other types of polymorphic VT (including TdP). Heart rate is >100/minute with wide QRS complexes. RR intervals are not regular (regularly irregular). ECG 2. Bidirectional ventricular tachycardia (VT) in a patient with CPVT. ECG 3. The ECG above shows bidirectional ventricular tachycardia that arose at peak exercise in a patient with CPVT. ECG 4a. The ECG above is from a 72 years-old man who has been hospitalized for acute cerebrovascular accident. Cardiology consultation was requested for attacks of tachycardia. The rhythm is atrial fibrillation in the presence of left bundle branch block (LBBB). ECHOcardiogram showed left ventricular dilation and systolic dysfunction with significant mitral valve stenosis. 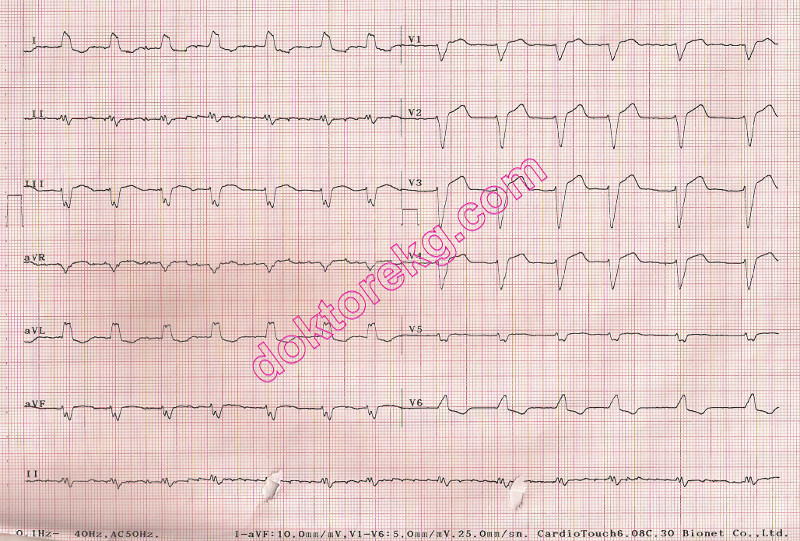 The patient had been on Digoxin therapy for a long time. His serum potassium level was measured below 3 mmol/L. Hypokalemia increases the risk of Digoxin toxicity. ECG 4b. Then, his 24-hour cardiac rhythm was recorded by a 3-channel Holter recorder. The Holter tracing above is from the same man and shows that aberrant conduction developes when heart increases. ECG 4c. The above Holter tracing is from the same man. Conduction without aberration, aberrant conduction and ventricular couplet VPCs are seen. VPCs are the most frequently observed ECG abnormality in patients with Digitalis intoxication. ECG 4d. The above Holter tracing is from the same man. Conduction without aberration, aberrant conduction and non-sustained ventricular tachycardia are seen. The last beat of the VT attack is a fusion beat. ECG 4e. The above Holter tracing is from the same man. Conduction without aberration, aberrant conduction and bidirectional VPCs are seen. In patients on Digoxin therapy, bidirectional VPCs should raise the suspicion of toxicity. ECG 4f. The above Holter tracing is from the same man. Conduction without aberration and non-sustained bidirectional ventricular tachycardia attack are seen. 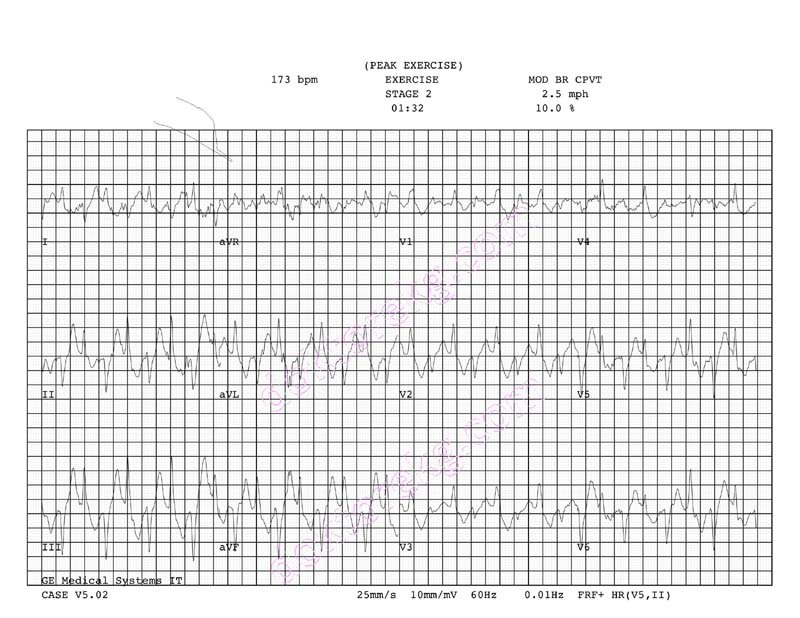 Bidirectional ventricular tachycardia is typical for Digoxin intoxication. ECG 4g. The above Holter tracing is from the same man. Conduction without aberration, aberrant conduction, short-lasting bidirectional VT attack and VPCs are seen. aberrant conduction and non-sustained ventricular tachycardia with a different morphology. Digoxin decreases the excitability of cardiac conduction system while increasing the excitability of myocardial cells. This is the reason why VPCs and Ventricular Tachycardia attacks with different morphologies may be seen. aberrant conduction and non-sustained ventricular tachycardia with another morphology. ECG 4j. The above Holter tracing is from the same man. Conduction without aberration, aberrant conduction and artifact are seen.